A week ago, I had one of the most bizarre experiences of my life – I was dead. Well, not really, but one of my friends thought I was. I was getting ready for bed and kept hearing incoming email notifications from my laptop, which happened to be open and playing music. It was unusual to get so many emails around midnight, so I went to check and see what was up. 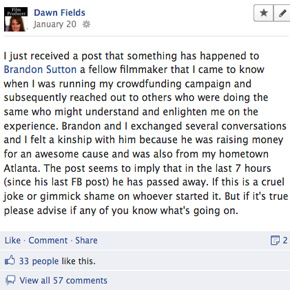 It turns out that a friend and fellow filmmaker heard through her network that Brandon Sutton had died suddenly that day. Not realizing that this was a different Brandon Sutton, she went on to Facebook to try to confirm whether it was true or not. She tagged me in the post, which caused me to get all the follow-up replies. I’m sure I’m not the only one that’s ever been curious about how the world would react if I died, but I somehow doubt that many people get to find out while they are still alive. Well, now I know, in a way. The outpouring of support and comfort from my friend’s network was incredible. And this is from a person that I barely know. We met through our crowd-funding efforts for our respective films and developed a bond over this shared interest. Apparently, it was enough to cause her grief when she thought I was gone. So, what happens when you get a taste of being dead while you’re still alive? Well, for me, it’s made me double down on my efforts to use every day that I’m alive to make a positive contribution to the world and do the work that I feel compelled to do. Some call this legacy work, but I prefer to just call it the work. Why compartmentalize work that makes a positive impact on society? Why not make this work the primary focus of our lives and figure out how it can sustain us financially? These are the questions I’ve been asking for the last few years. It’s not about what people think of me when I’m gone, as that really doesn’t interest me that much. I’m more concerned with how I live my life and what I do with the time I’m given in this physical body, right now. A couple of people have asked me recently ‘what is your biggest fear?’ My answer to that question is that I fear I won’t do enough to reach my potential to make the world a better place with my time here on earth. To be sure, this isn’t something I obsess over, but it is definitely an area of concern. See, I believe that with every day that goes by, there are opportunities to create positive change in the world. Every encounter we have is an opportunity to spread joy to others. Every moment that we spend with people we care about is a chance to show our appreciation for them. We are all blessed with opportunities to make a difference, regardless of our specific circumstances. We get to choose what we create out of these opportunities, each and every day. Chris Guillebeau wrote about urgency and legacy recently in his latest manifesto, The Tower. He talks about what we are each building in our lives and how the world needs us all to express our own creativity through constructing something purposeful. I encourage you to download it and spread it to your friends and family if it resonates with you (and I seriously hope that it will). Ironically, I’m in the process of leaving my home of 9 years (known as ‘The Tower’) and embarking on a new chapter in my journey. This is one of the biggest transitions I’ve ever gone through and it’s bringing up a lot of emotions and reflections on my life thus far. More on that next week, but for now I would love to hear your thoughts on legacy, meaning, and doing work that you feel good about. If you were gone tomorrow, would you be proud of what you accomplished in your life? If not, what changes can you make today to move in that direction?